In the very first release of our Day in the Life series, Sage Corps fellow Andrew Fagin shows us what it’s like to live and work in Melbourne, Australia. Crikey! As a Penn alum, I’m admittedly biased whenever I get to brag about those students in our global entrepreneurship program. Years later (I won’t date myself), I still vividly remember my time on campus, and of course my semester abroad in Spain. After graduating with degrees in Spanish and International Relations, I then spent a year in South America. These global experiences later inspired me to build a law career representing Latin American clients. But, when I was a 22 year old living in Buenos Aires, I never imagined that I would one day commit my career to helping students from my alma mater (and 75 other universities) have their own global experiences. Since launching our program in 2013, we’ve had 29 Penn students participate, with 7 in our summer cohort this year. After Sage Corps, these students have gone on to incredible professional opportunities at consulting firms, top tech companies, VC funds, Fortune 500 companies, and of course startups. Others have even started their own companies — shout out to Woveon and co-founder Adam Rawot. But today I’m excited to share the experiences of two Penn students, Nicole Profit and Eric Zeng, currently abroad in our 2017 summer cohort. Nicole, a junior in the Wharton School, is a data science intern for Northraine, a predictive analytics R&D and consulting firm in Melbourne, Australia. Her client projects this summer include: (1) researching different platforms for creating chatbots for Facebook Messenger and storing user interactions with the chatbot; and (2) working on a biotechnology project for which she codes functions that can efficiently detect and remove all of the extraneous features in the scans of pregnant women. "My biggest win this summer has been successfully presenting the research I had been doing on chatbots to a client who was interested in using a chatbot for her company’s Facebook page." "The biggest challenge that I’ve overcome this summer has been learning how to write simple functions in a new [software] programming language." "This experience has helped me get closer to achieving my career goals by providing me with invaluable experience in technical analysis." "So far, our cohort has gone to the Eureka Tower, one of the tallest buildings in the world. The view of Melbourne from the top of the tower was truly amazing. We also went to see the Twelve Apostles, a beautiful collection of limestone stacks by the Great Ocean Road. Seeing a kangaroo hop across the road on our road trip to see the Twelve Apostles was one of the coolest moments on the trip." Upon graduation, Nicole hopes to work in business analytics role. 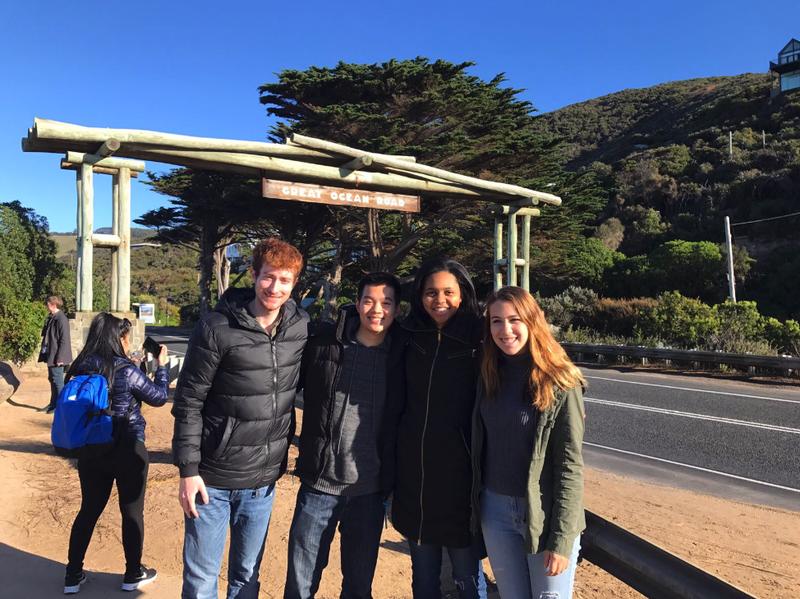 Nicole and her cohort visiting the Great Ocean Road. Eric is a rising sophomore in the Engineering School studying Electrical Engineering. He is currently in Hong Kong working as an electrical engineering intern at Ampd Energy, which offers a state-of-the-art lithium-ion battery energy storage solution across home, commercial and industrial applications. At Ampd Energy, Eric performs a variety of testing on components in the company’s electrical system. "To always ask questions, no matter what. If you sit by and do not ask, you will not do anything meaningful. Even if you think you are bothering your coworkers, it is better to have the right information than to work in the wrong direction." "I chose Sage Corps because it offered me a vacation and work experience in one. I could explore a city that many of my friends had recommended to me while experiencing my first professional tech environment." "Enjoy the view. Foreign cities are beautiful in their unique ways. Being able to slow down within a hectic schedule is essential to maintaining a feeling of balance in an unfamiliar environment." "Getting dinner. Really, the food is so good here." "It has given me a taste of industry-level work and what electrical engineering is like in the real world. It has helped me decide what my major is, as well as what kind of a worker I am." Eric is considering several paths after graduation, including graduate school or joining a more established tech company. Now that he has a taste of the startup life, he’ll consider that option, but he’s not quite ready to launch his own venture, he says. It has been great to watch Eric and Nicole grow both personally and professionally this summer. My team and I are excited to see what lies ahead for these two fellows as well as our other Penn fellows!